A dark spy-comedy from Academy Award winners Joel and Ethan Coen. 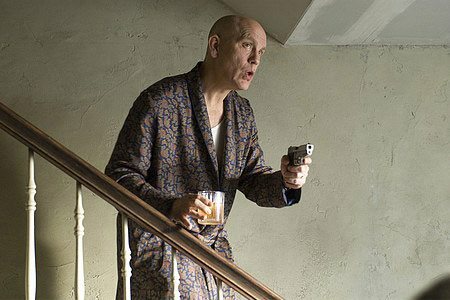 An ousted CIA official's (Academy Award nominee John Malkovich) memoir accidentally falls into the hands of two unwise gym employees intent on exploiting their find. 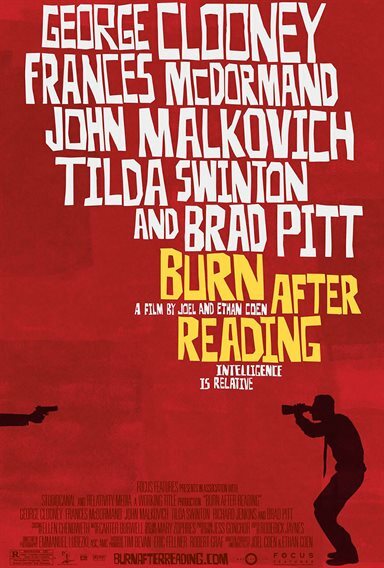 Download Burn After Reading in Digital HD from the iTunes store. Burn After Reading images are © Focus Features. All Rights Reserved. The Coen brothers have a long history of doing comedic films with dark streaks (The Big Lebowski, Fargo). They have a real talent for the off-beat, witty dialog, and sudden, shocking violence. Many of their heroes are anti-heroes or, perhaps, just "protagonists" and not really "heroes" at all (I'm hard pressed to think of any character they have done who you can root for as much as Frances McDormand's Marge Gunderson in Fargo). 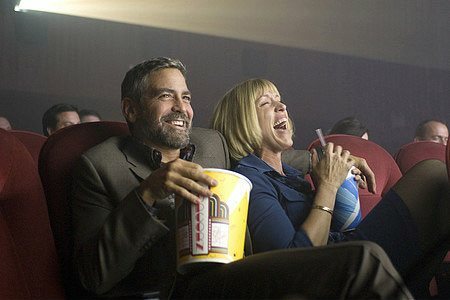 After the explosively violent, ultimately bleak No Country For Old Men, they have returned to comedy--albeit a black comedy--in Burn After Reading. It's hard to say that the story "revolves around" a disc with documents on it relating to two greedy fitness-club workers believed to be lost state secrets, the CIA analyst who owned it (and is now being blackmailed), and a set of love triangles between these and other characters. This is because if the plot "revolves" around anything it is the extreme and pointed idiocy of the characters. In Burn After Reading just about everyone is some kind of idiot, and as the movie was cast with all of the principles save for Tilda Swinton--who plays such an iconic ice-queen pediatrician that I have to wonder how she could not have been the actress the role was created for--I'm not sure that's saying anything good about George Clooney, Brad Pitt, and John Malkovich (nor Frances McDormand). Apparently when Pitt reviewed the script he told the Coen brothers that he wasn't sure he could play the part as his character was such an idiot (there was a pause and Joel told him "You'll be fine"). The action in the movie does sort of "begin" with two foolish gym employees finding a CD and deciding to ransom it back to the owners (something the movie gets right is that Microsoft Office documents have data on them saying who created them that you can get if you know how--it should go without saying that the character doesn't know this, but has a friend who does). Since all the other characters in the movie are cheating on their spouses, everyone is paranoid. To each of them the situation looks far more dangerous than it actually is. In Burn After Reading there are shocking moments of violence and bloodshed: it earns its R rating. The pacing of the movie is intentionally uneven; there is a sense of chaos that runs through it (it has been said in other reviews that it is as bleak as No Country For Old Men --just "funnier.") So the question is: how funny is it? The answer depends on how entertaining it is to watch people act like idiots. Where Big Lebowski's main character was certainly no brain surgeon, The Dude had an easy likability and we wanted to see him succeed. In Burn, I couldn't bring myself to root for just about anyone (and while some of the characters get 'what's coming to them', the movie has no real cosmic sense of justice). It isn't a tragedy. It isn't a narrative of exalting the bad over the good; it's a story where most of the main characters are so flawed it is hard to connect with them. This is a good trait in a monster movie where they will get killed off (it worked for the vapid 20-somethings in Cloverfield), but it's harder to make comedy work with it. 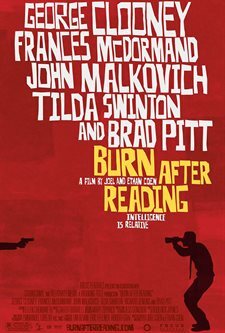 I think that in this sense, Burn After Reading winds up burning oil instead of gas: the effort necessary to pull the movie along sometimes seems to get the better of the script. When a character died off-screen in No Country For Old Men, it was a heart-stopping, jaw-dropping defiance of genre and expectation. When it happens in Burn After Reading, we're just kind of glad the last scene didn't go on any longer. I do want to call out the acting. Clooney will briefly use his eyes to portray all his emotions about how he feels leaving one marriage and getting into the next. A woman reading to school children gives us a mercifully short performance that tells us precisely how little she wants to be there (and no one else wants her there either). Two seconds of Tilda Swinton as a doctor examining a child lets us know what it'd be like to be married to her. The movie displays the Coen brother's best-of-breed craftsmanship. It leverages its actors as scalpels. Whatever its flaws, it does not hurt for ability or vision. 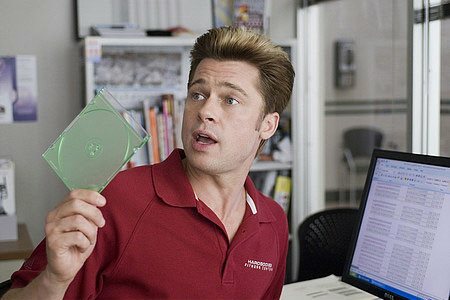 Burn After Reading images © Focus Features. All Rights Reserved.